No matter which words you choose, language is always the channel of love. For Valentine’s Day, we teamed up with our friends at OkCupid to poll singles about everything from borders to attractiveness, receiving over 700,000 responses. When it comes to love, it turns out people are more open to new languages and cultures than you might think. The takeaways? Almost everyone is interested in learning a new language: 91% of men and 93% of women. If you’re looking for love and are between 18 and 36, being bilingual could help you out. 73% of millennials, ages 18 to 36, find speaking another language attractive. Interestingly, there were also some gender differences. 69% of men and49% of women polled said they would date somebody who did not speak their language well. Read the full report below and share your thoughts in the comments or on social. 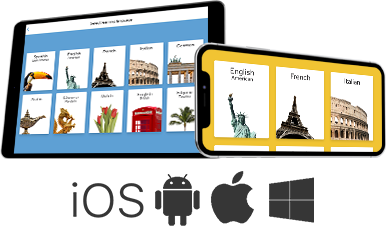 If you’re ready to start a new language, for romance or otherwise, we’ve got a treat for you: save up to $96 on a Rosetta Stone subscription when you buy today. Plus, get three free months of OkCupid A-List with code VDAY2018. Limited to the first 300 new OkCupid account users who sign up on the mobile app.